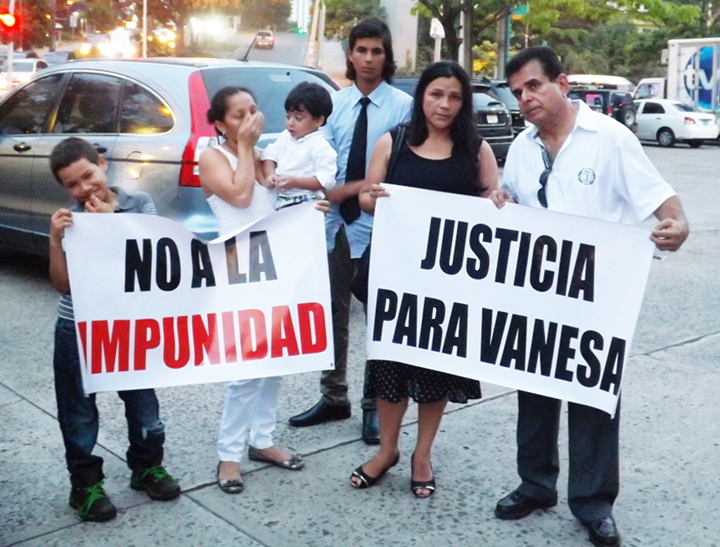 Family of 25-year-old law student Vanesa Rodríguez demand justice for her slaying. Photo by Eric Jackson. The US military prosecutors’ theory is that Master Sergeant Omar Velez murdered Vanesa Rodríguez but it wasn’t premeditated. Velez’s defense lawyers are arguing that the woman’s death at a Panamanian National Police training site in Los Santos was an accident. If Panamanian prosecutors have a theory about what happened, they aren’t saying: the official position is that this crime is none of their business. The arguments about what happened and what to call it will happen sometime next year in North Carolina. On September 28 in a military courtroom on Fort Bragg a series of pretrial motions made by the defense were heard. One of the defense requests was to delay the trial until next March and as the prosecutors did not object the military judge, Colonel Christopher T. Fredrikson, granted that postponement. The motions that ought to be the most politically controversial, but probably won’t be, were attempts to suppress evidence taken in a search of Velez’s Panama apartment and from the taking and testing of blood and urine samples from the soldier. It’s about wheher this “War on Drugs” operative, assigned to the US Army Security Assistance Training Management Organization and sent to Panama to train police officers to be soldiers who carry out US anti-drug policies, was himself under the dangerous influence of steroids at the time. Steroids are and have been a major problem in the US Armed Forces and information about the extent of it is often suppressed by the military itself or by the politicians who give them their orders because it’s embarrissing and could have some far-reaching legal consequences. At Velez’s initial booking steroids did not enter into the story, by a US Army magistrate issued warrant to search Master Sergeant Velez’s quarters in Panama, and because steroids were found, issued a warrant for the drug testing. (At about the same time The Panama News raised the steroids issue, because photos of the soldier suggested that and because friends of the slain woman told this reporter that Velez used steroids.) Velez is charged with second degree murder, aggravated assault, adultery, obstruction of justice, possession of steroids and use of steroids. He could get life in prison. The judge did not rule on the defense motions to suppress the steroids evidence. If he rules in favor of the defense on those points it would remove the steroids charges from the case. Were the case to have been tried here, there probably would not have an instant decision like that of the US authorities to declare the crime unpremeditated. Certainly a “roid rage” theory of the crime would suggest a murder arising from a sudden emotional outburst. However, Velez was in Los Santos training National Police lince units — the cops on the motorcycles with automatic weapons — and called Rodríguez to come from Panama City, where she lived and studied law at the University of Panama, to visit him in Los Santos. He killed her there, near a National Police training facility on the Guarare River. He was in the process of burying the body when he was detected and arrested by some of the police officers he had been training. That Velez called Rodríguez to the place where he killed her might suggest premeditation. However, Velez was quickly surrendered to the US Embassy by Panamanian authorities pursuant to a secret Status of Forces Agreement (SOFA) made between the Martín Torrijos and George W. Bush administration. This agreement, which is not a treaty that was presented to either the US Senate or the Panamanian National Assembly for ratification, provides that US military personnel sent to Panama on training missions get diplomatic immunity. On the same day that Velez was in court, in the Dominican Republic that country’s Constitutional Tribunal struck down a SOFA that gave diplomatic immunity not only to US “War on Drugs” military personnel but also to civilian mercenaries such as people from DyncCorp or Blackwater/Xe. That SOFA also gives diplomatic cover for American military and civilian personnel who come to the DR on disaster relief missions. The Dominican court’s decision was unanimous. All 12 judges agreed that the SOFA is “a violation of national sovereignty and, consequently, the Dominican state.” So far neither the US nor the Dominican administrations have commented on the decision. SOFAs are well nigh ubiquitous wherever American soldiers go. However, they are increasingly controversial in the world, particularly because the US justice system has usually neither sought nor done justice for cases of torture or other serious violations of international law. Although a limited number have since returned for special operations against the Islamic State, US troops were withdrawn from Iraq when the government of that country refused to sign a SOFA providing immunity to US troops.